The latest version of the successful Aspire Timeline Series has a basically revised interior and particularly wants to score with customers through more performance. 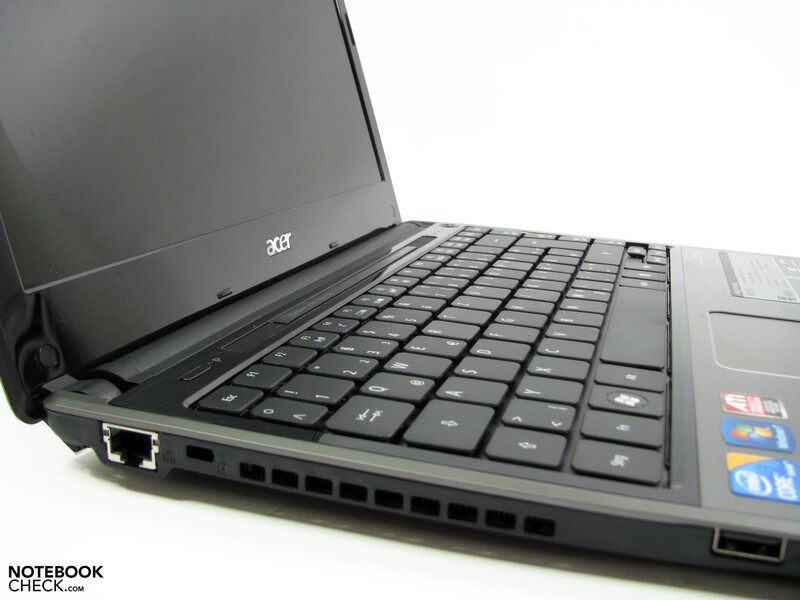 We've comprehensively reviewed Acer's success in this undertaking. 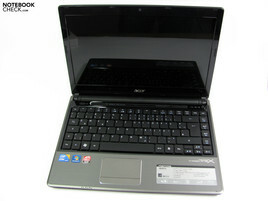 At the moment, Acer has three different Aspire 3820 Timeline X configurations available. Whilst all three configurations have a 4 GB DDR RAM and 6 cell battery in common, the main differences are found in the processor, graphic chip and hard disk capacity. 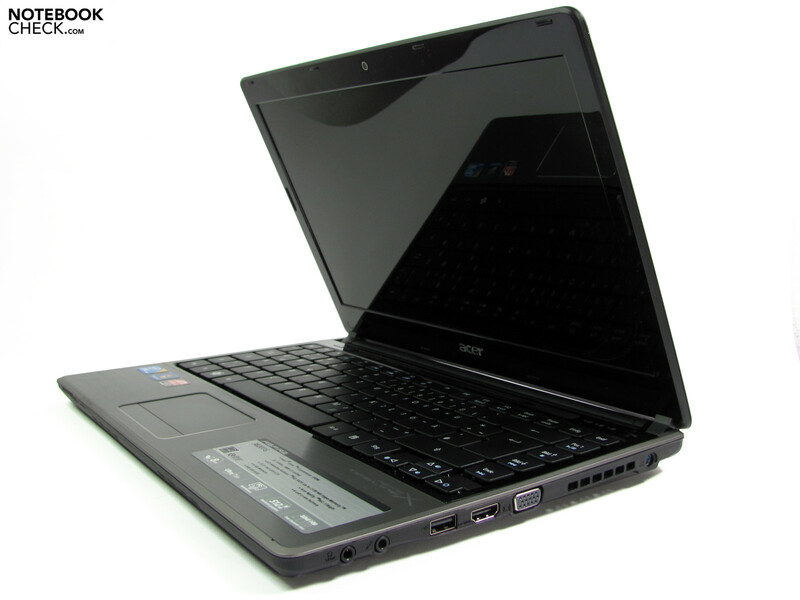 The "basic" alternative has a Core i3-330M CPU, an Intel HD graphic chip set and a 320 GB hard disk. 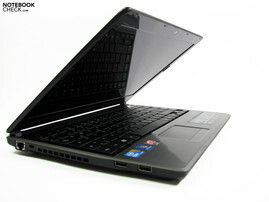 The middle alternative has the same processor but can serve with dedicated ATI HD 5470 graphics and a 500 GB hard disk. 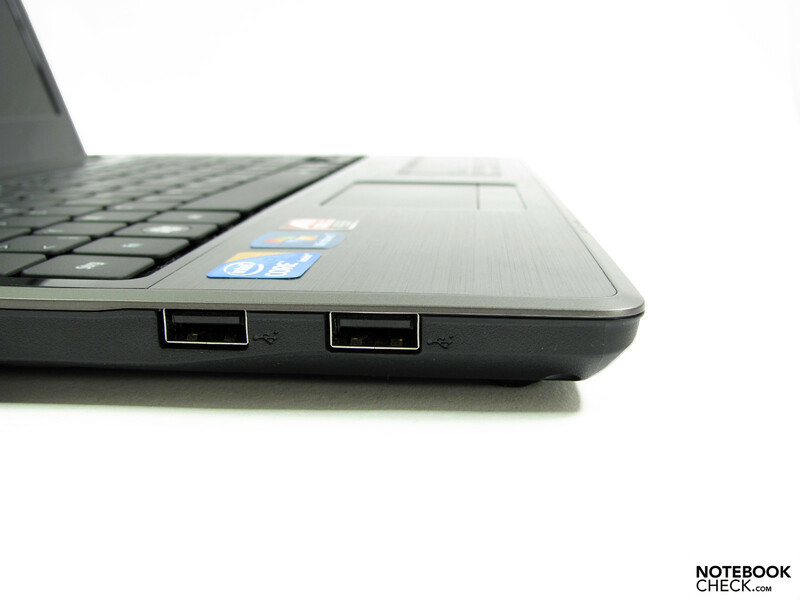 You'll ultimately find Intel's Core i5-430M, ATI's HD 5650 and a big 640 GB hard disk in the premium model. Our prototype is the middle version and currently available for not quite 800 euro. Our black test sample has a fine structure in aluminum look on the display lid and in the wrist-rest area. 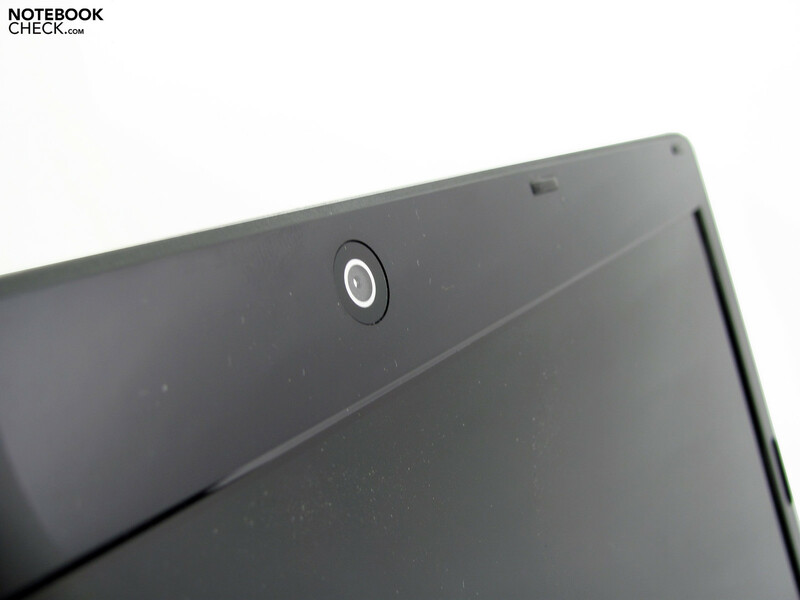 The display bezel is coated in high-gloss black, just like the keyboard's border. It looks great when it hasn't been used, but is covered quickly with ugly fingerprints. The display bezel also annoys with additional reflections. The case has only gained a bit in terms of size with 29x324x235mm in comparison to its predecessor and makes a very robust impression. The wrist-rest, like the rest of the case, can't be depressed. 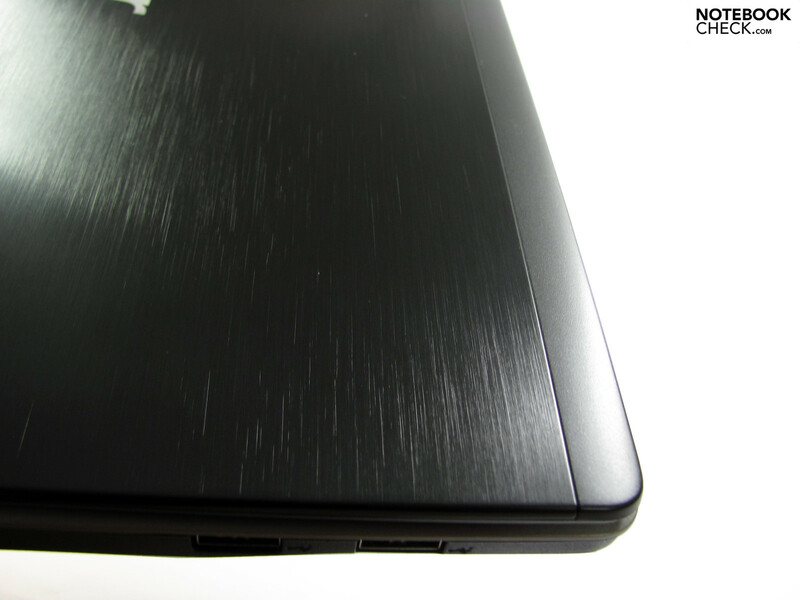 The workmanship is good, the gaps are even, protruding edges or ridges can't be detected. 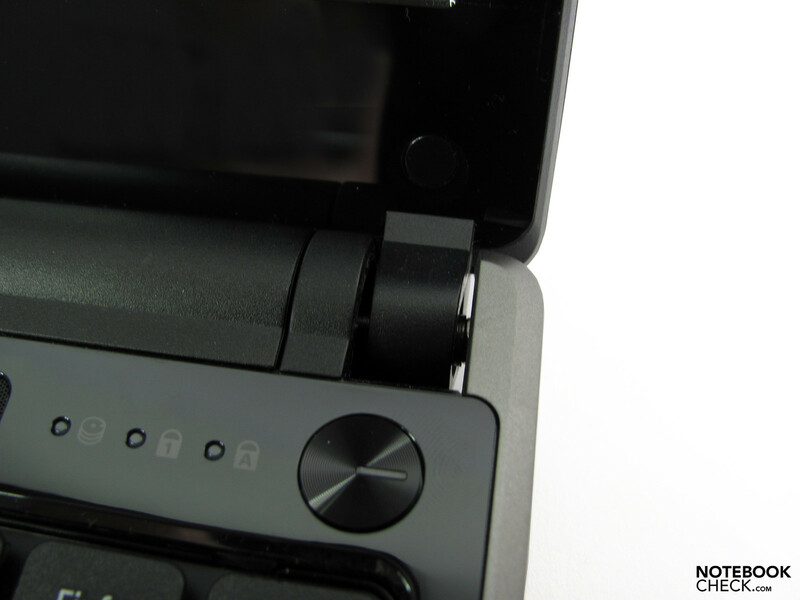 The battery fits tight and the components are easily accessible from the bottom. The display's lid has to be classified as significantly more yielding, but it protects the screen well and only allows slight image distortions when pressure is applied to the bezel. Display and base unit are joined by two hinges that have a solid firmness. A teetering can't be completely prevented merely under strong vibrations, such as a train journey. In comparison to its predecessor, Aspire 3810T with 1.64 kg, it's a bit heavier with a weight of 1.81 kg. However, the additional components have to be considered, which in return relativize the difference. In return, the adapter of 540 g has gained weight significantly, which reflects the increased power consumption under full load. The connectivity turns out rather sparse and is more on par with current netbooks than that of subnotebooks. Hardly more than the basic requirements are covered with 3 USBs, HDMI, VGA, 1 audio-out with SPDIF support, 1 microphone-in, network and DC-in. 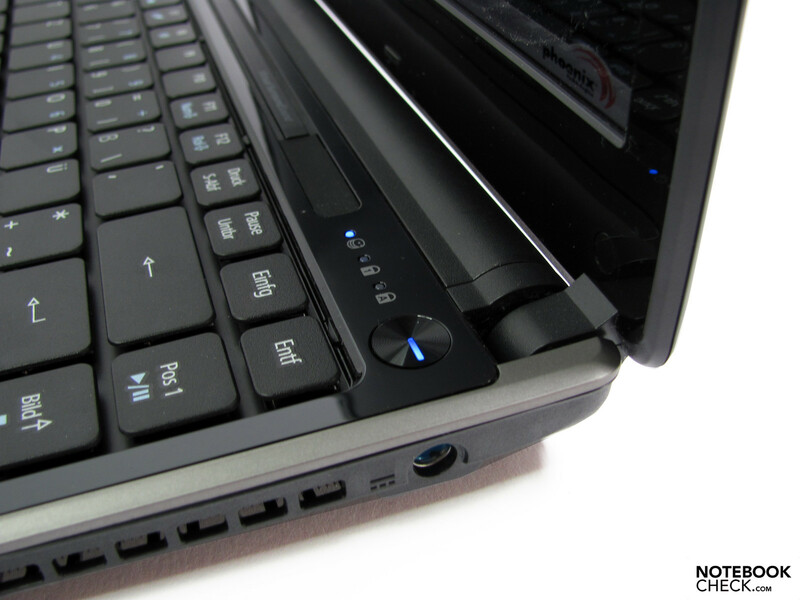 In particular, an ExpressCard slot for extensions and a fast data transfer option via eSATA or USB 3.0 have been omitted. 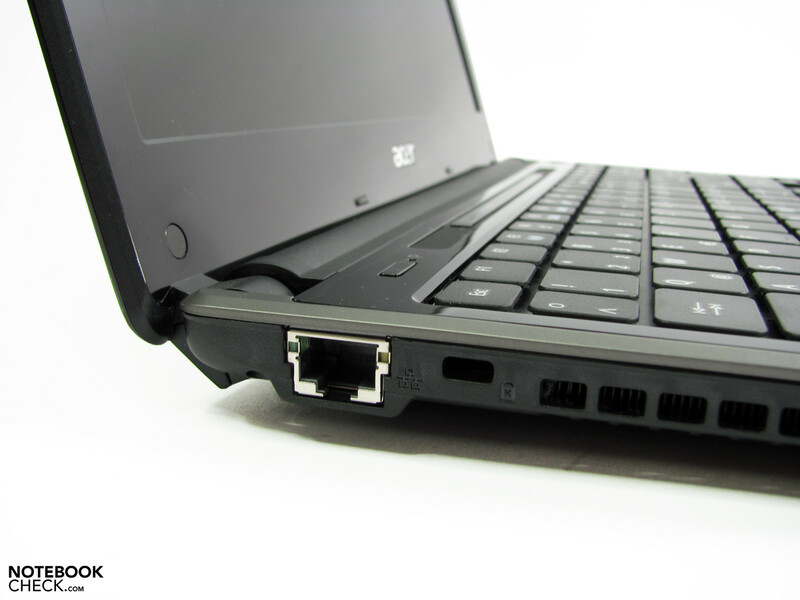 You can connect to external devices wirelessly via WLAN 802.11 b/g/n or via Bluetooth 2.1+EDR. We've determined 25.3 MB/s as the maximum USB transfer rate and the VGA signal quality, which would at least be of interest for users of analog monitors only, provides a subjectively good and focused image at a resolution of 1280x1024. The cardreader supplies a standard result with a read rate of 17.3 MB/s, tested with a SD memory card from OCZ (150x). 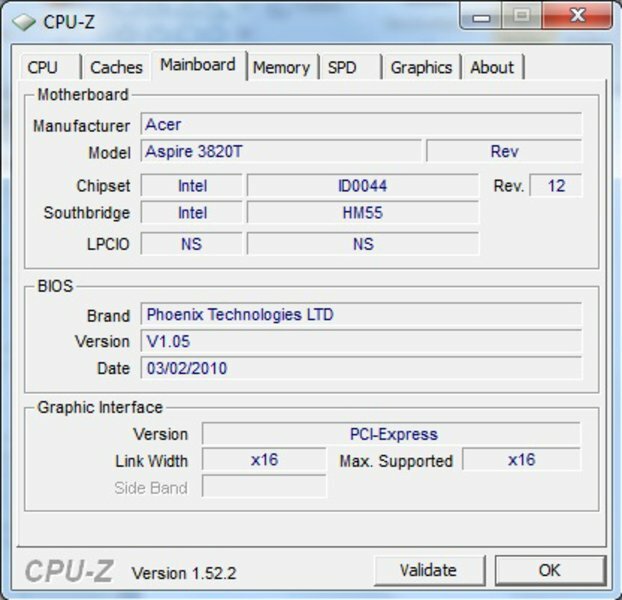 Apart from the known Acer tools, a few trial versions and Windows 7 Home Premium (64 bit) usual for this category, you'll also find MS Works 9 in the scope of supplies. Recovery media isn't included; there is only a recovery partition on the hard disk available for a future recovery. Therefore, it's recommendable to create the according DVDs on your own as soon as possible. 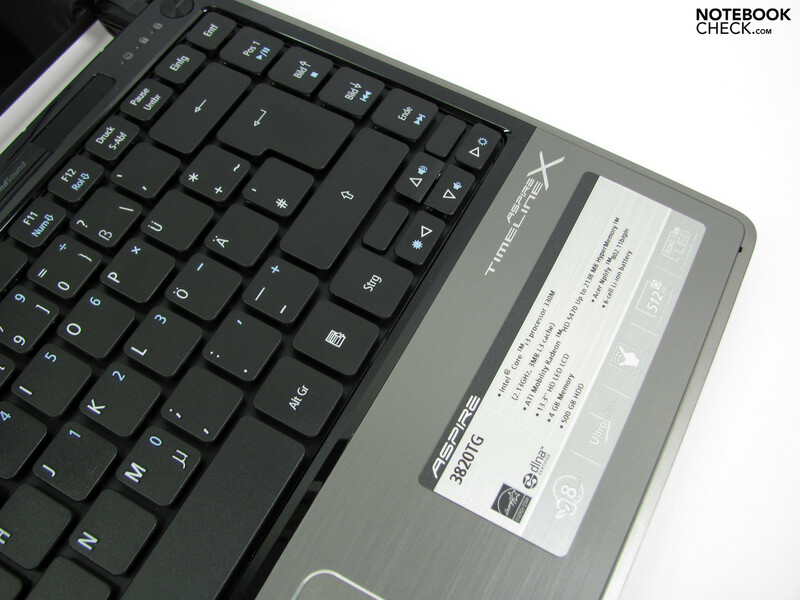 The keyboard fills out the case width well and thus bids comfortable key sizes. 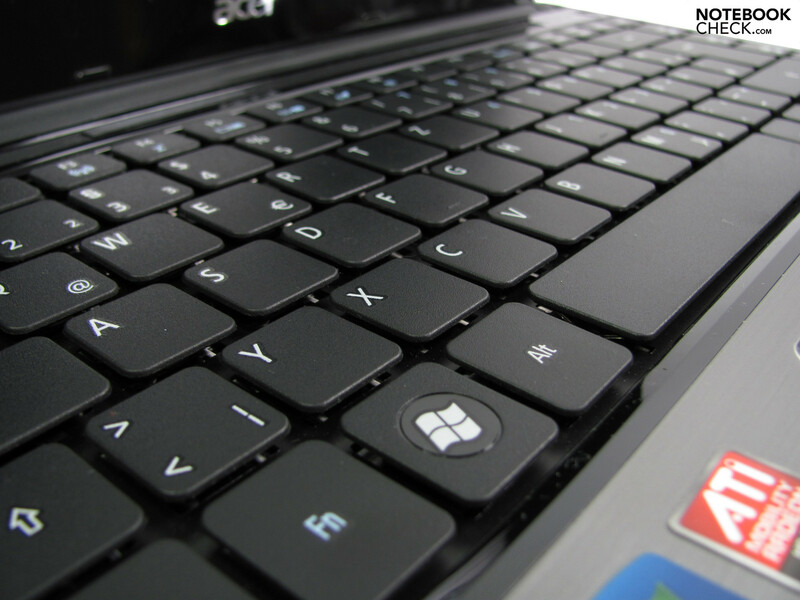 The over-sized shift key on the right opposes a somewhat smaller shift key on the left. Even the tabulator key and arrow keys could have done with a bit more size. Overall, the layout is okay though and most users won't need much time accommodating. The lettering is contrast rich and allows the figures to be seen for quite a long time even in dimmer surroundings. The notebook doesn't have a keyboard light. The keyboard's stability and quality impression isn't at all pleasing. 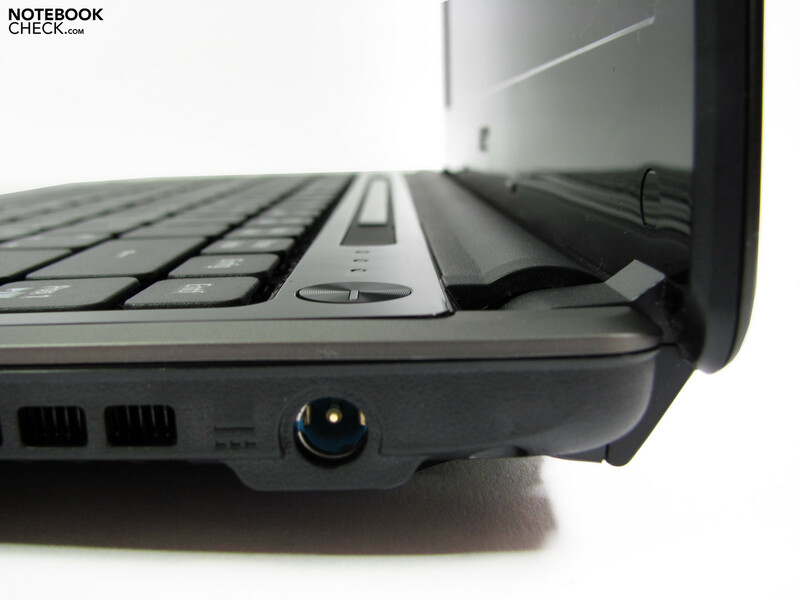 The keyboard can already be bent visibly under slight pressure and thus suggests a less stable subconstruction. The keys teeter slightly when they are hit at a corner and thus already appear to be instable. Additionally, the big keys, like space and enter, emit a somewhat clattery stroke noise. How well you can cope with that varies individually. Frequent typists will probably hardly benefit from the keyboard in the long run; "normal" users will likely not have as many problems. 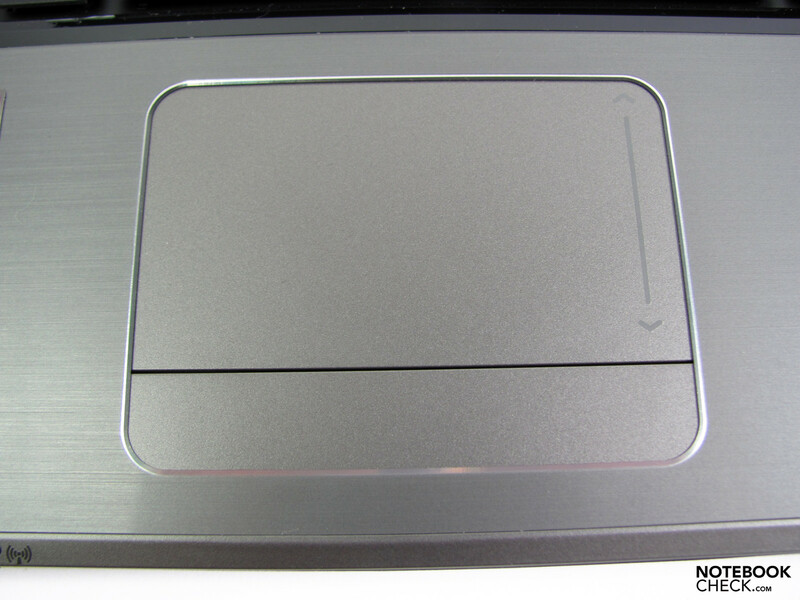 The touchpad is sufficiently sized, has good gliding traits and a good responsiveness. It has been submerged a bit into the wrist-rest and quickly becomes noticeable when the borders are reached. There isn't a separate on/off switch - this function has been moved to the keyboard area as a FN combination in opposition to its predecessor. The usual multi-finger gestures, like zooming etc., are supported. 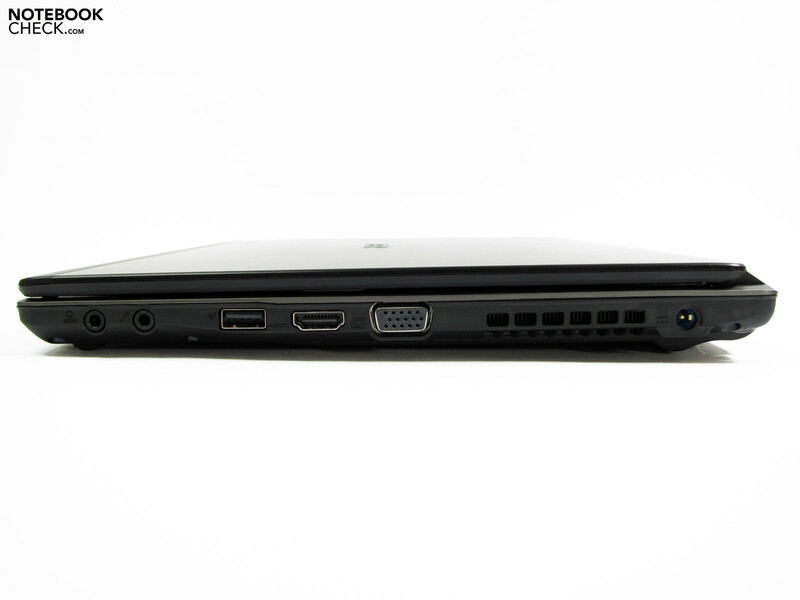 The Aspire 3820TG's 13.3" HD LED backlight display has a resolution of 1366x768 pixels and has a 16:9 aspect ratio. Movies are rendered with a slighter, or even completely without, a black bar. 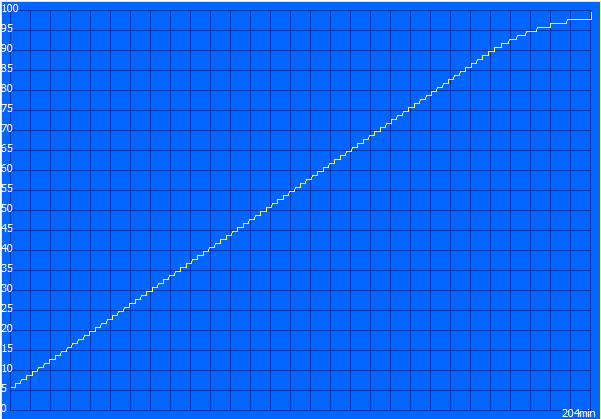 The point density is 118 dpi and thus represents a good compromise of presentation size and available desktop surface. Acer calls the AU Optronics display with a reflective surface "CineCrystal" and promises an excellent presentation of multimedia content. Our prototype can't supply the promised brightness of 200 cd/m2 at any measuring point. We've established a range of 168 cd/m2 to 197 cd/m2. This adds up to 183 cd/m2 on average with an illumination of 85%. 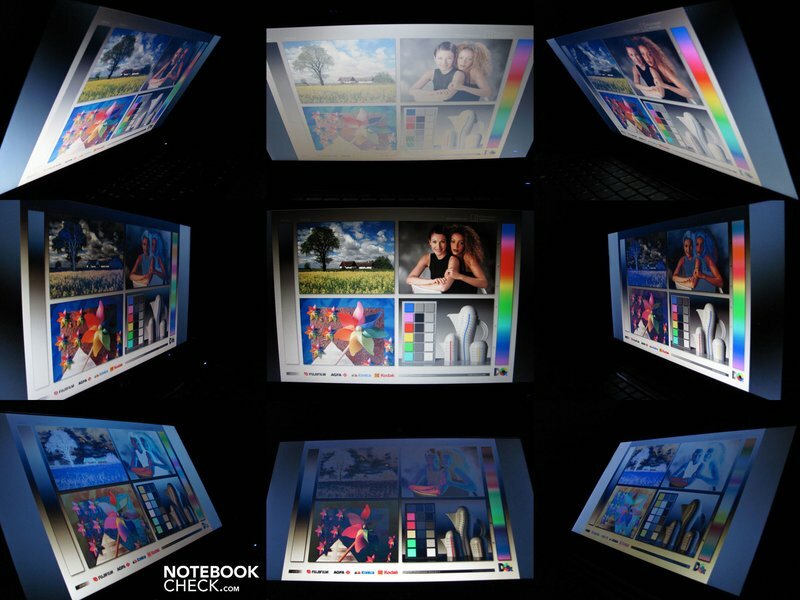 The brightness is fully sufficient for indoors, but if the subnotebook is used outdoors or in unfavorable, varying light conditions, you'll only see extremely restricted image contents. Besides that, the reflective surfaces have an especially adverse effect in this kind of situation because surroundings overlay display contents and provide for additional distractions. The measured black value of 1.42 and the maximum brightness results in a contrast ratio of a low 132:1. You shouldn't expect a saturated black, just as little as crisp colors. 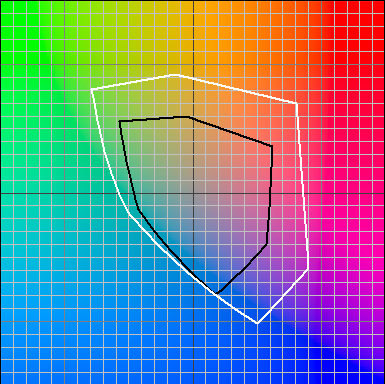 The latter is also enhanced partly by the low color space coverage of about 50% of the RGB's gamut. The viewing angle stability moves totally on par with the competitors and suffers under color deviations turning up quickly, inversions and color bleaching, especially on the vertical plane. The display content always stays visible on the horizontal plane and basically only changes in terms of color representation and brightness. The performance configuration of the current series goes far beyond that of what we've come to know from the preceding models. The Consumer Ultra Low Voltage CPUs with a low power consumption and moderate computing performance have been replaced by regular processors of the latest Arrandale generation and thus promise a high measure of potential performance gain. 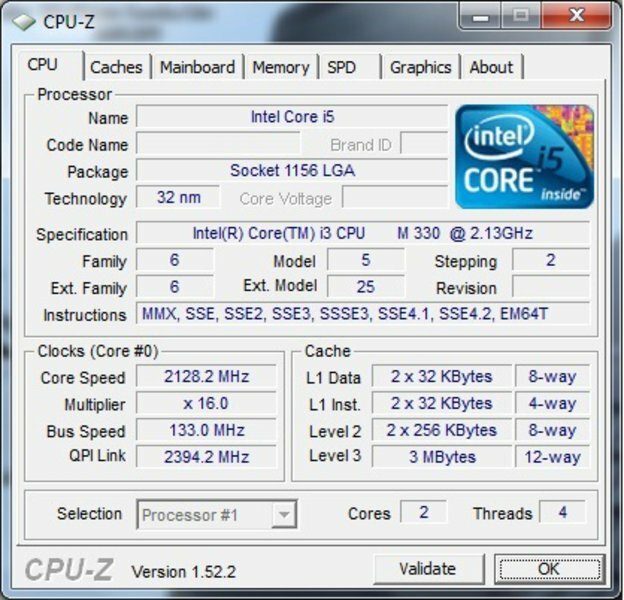 A Core i3-330M processor with a clock rate of 2.1 GHz and 3MB L3 cache, which has hyperthreading but no turbo boost in comparison to its bigger brothers, is used in our test model, The maximum RAM configuration is determined by a HM55 Express chip set and adds up to an up-to-date 8 GB. 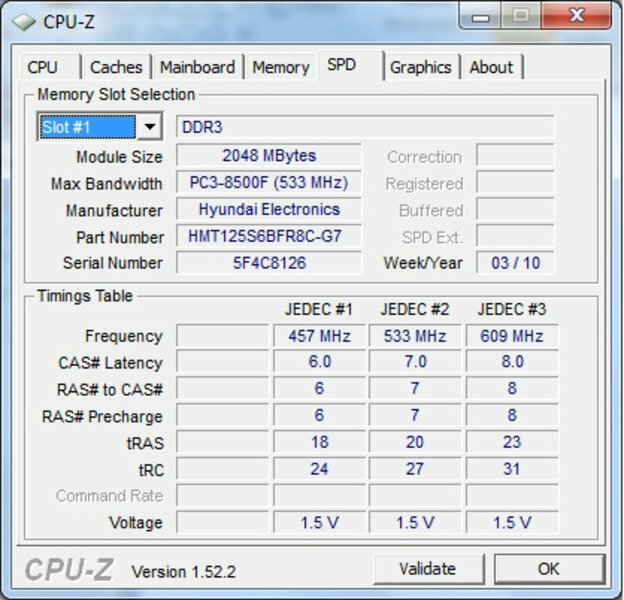 We've found a 2x 2GB DDR3 RAM built in. Aside from the CPU, the graphic chip and memory controller in the processor's encasing are also major innovations. It shortens the routes and increases the rates at an overall lower power consumption. 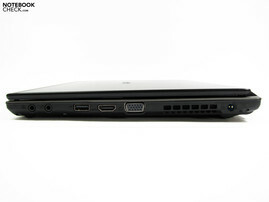 The graphic output can be managed by either the Intel HD graphic chip set (DX10) or the dedicated ATI HD 5470 (DX 11) depending on requirements. 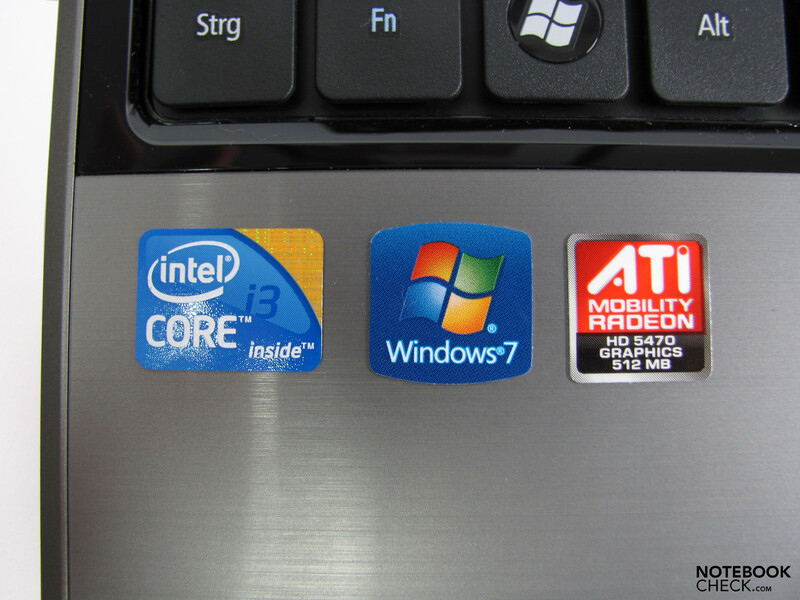 Both Intel and ATI call this technology "switchable graphics" and are comparable to Nvidia's Optimums in the result. Switching is executed manually via the ATI Catalyst Control Center and doesn't need a reboot. Principally a handy characteristic, as you can switch to the optimal graphic solution depending on the application and requirement. 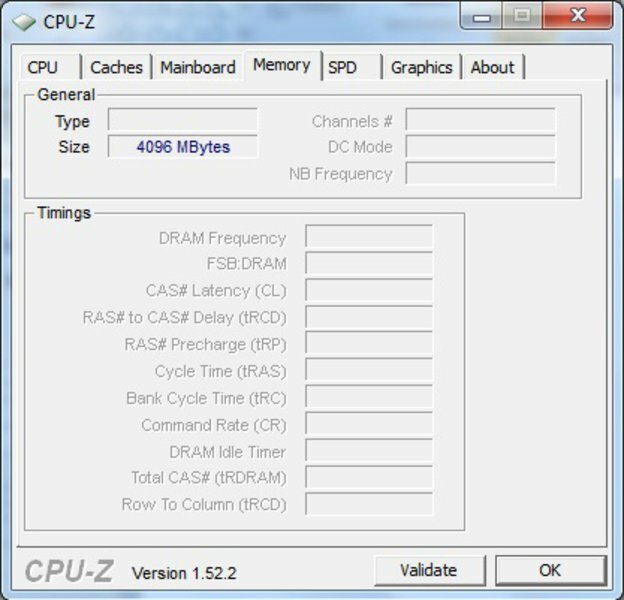 The available graphic memory of the ATI components is 512 MB DDR3 and is tethered with a 64 bit wide memory bus. The clock rates are 750 MHz (chip) and 800 MHz (memory). It can be classified as belonging to the starter class in terms of performance and thus not quite as suitable for demanding 3D applications in high resolutions. 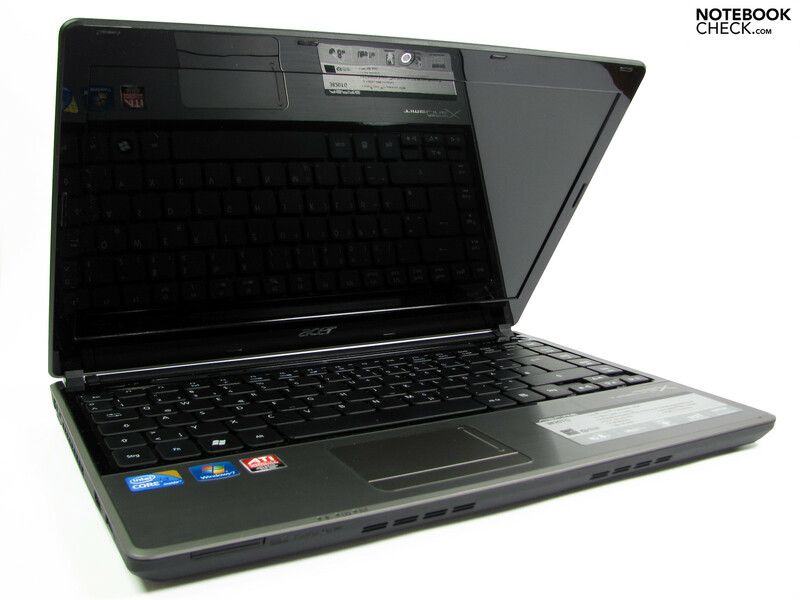 The benchmark results are consistently beyond those of the Acer Aspire 3810T or the Travelmate 8371, which belong to the preceding series. There is a difference of 3000 points in 3DMark06 and even the Cinebench OpenGL results play in a different league with 4000 points in comparisons to the predecessors' 700 points, with a GMA 4500MHD. The CPU benchmarks make the enormous performance boost even clearer. The prototype passed the WPrime1024 test in 752 s and SuperPi 32m in 1097 s. Intel SU9400 processors need an average of 2131 s (WPrime 1024) and 1858 s (SuperPi 32m) for that. The latest version computes about twice as fast in Cinebench R10. The candidate converts MP3 files to AAC formats via iTunes with a 25.7 fold velocity. 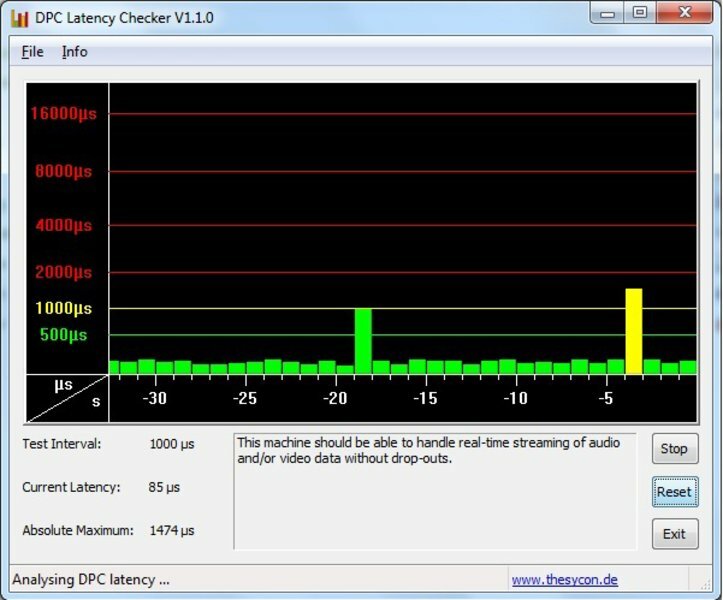 We check for latencies that might show up at ports with assistance from the DPC Latency Checker program. 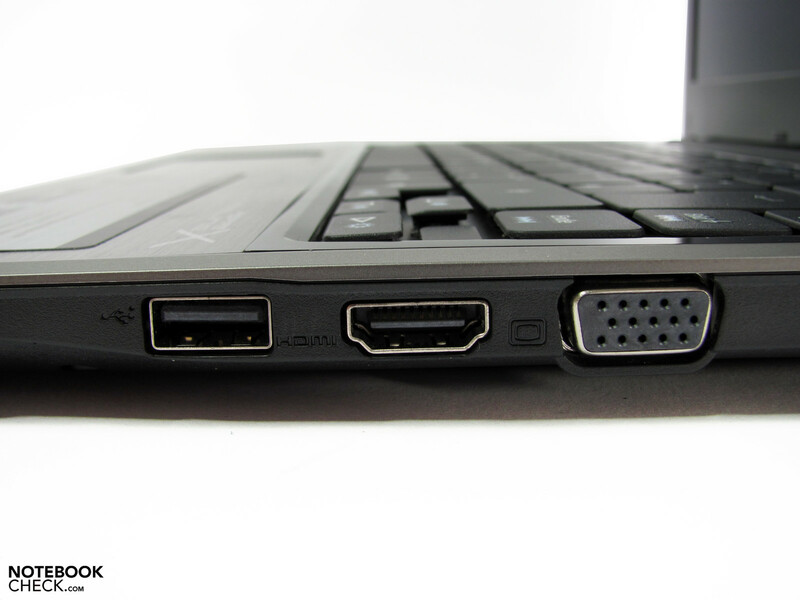 It could come to synchronization errors, such as sound crackling, when external peripherals are connected. We had to establish evident spikes far beyond the critical mark of 2000µs with enabled WLAN and LAN. The spikes first remain in an uncritical field when both components are disabled. 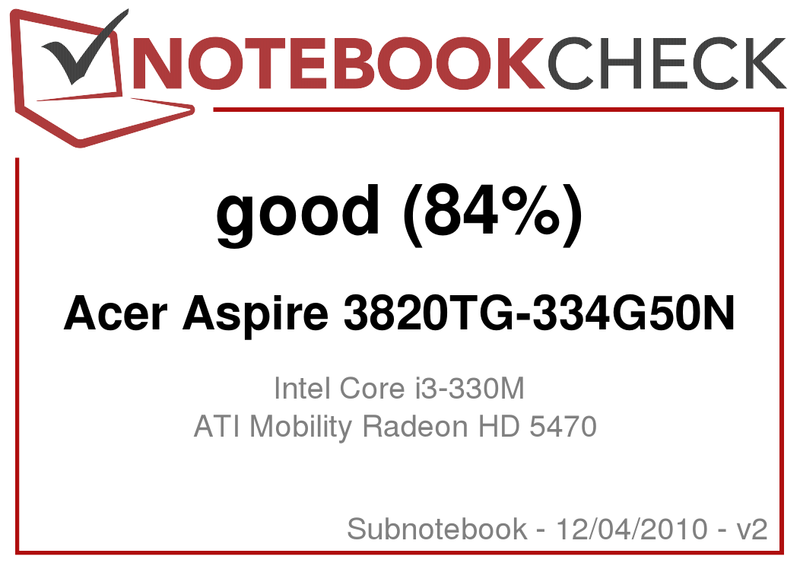 The Aspire TimelineX 3820G's application performance, which we assess with PCMark Vantage, leads with 4816 points in front of Acer's Travelmate 8371 with 2506 points and the Aspire 3810T with 3200 points. Thus it achieves an at least 100% higher result. 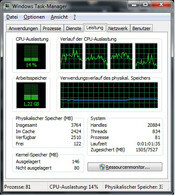 The Aspire even computes subjectively very fast in applications like Photoshop Elements, Open Office, image management, music management, internet and similar software. The utilized Hitachi hard disk has a lot of room with 500 GB and works with 5400 rpm sufficiently fast and also fairly quiet. The transfer rates are averagely 60 MB/s and even reach 80 MB/s as a peak. 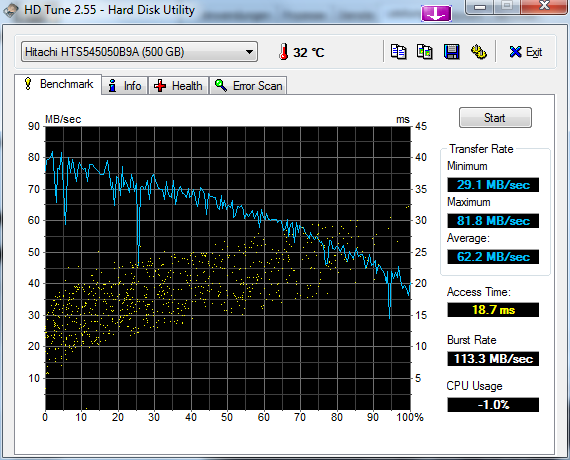 Hard disks with a higher rotation rate of 7200 rpm or solid state drives could provide a higher data rate. 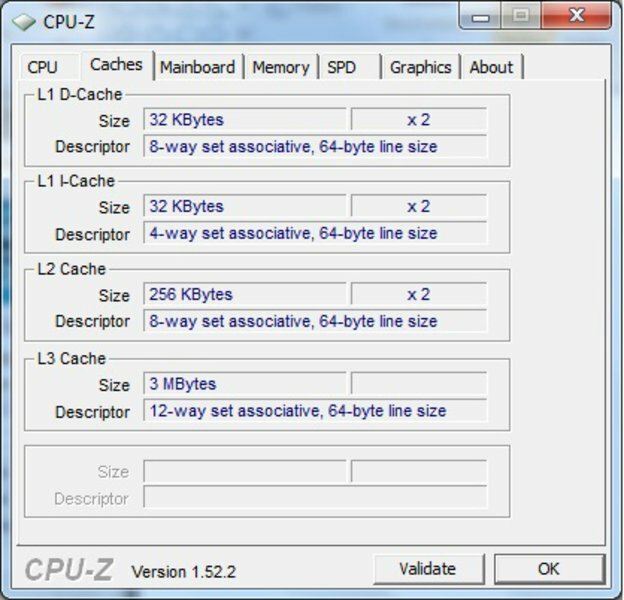 Not many programs use ATI Stream for outsourcing computing intensive tasks to the graphic chip. Cyberlink's Media Show, Espresso, is one of the few possibilities and also supports Nvidia's CUDA technology besides ATI Stream. Which graphic chip benefits from that can be found in a list on the manufacturer's site. 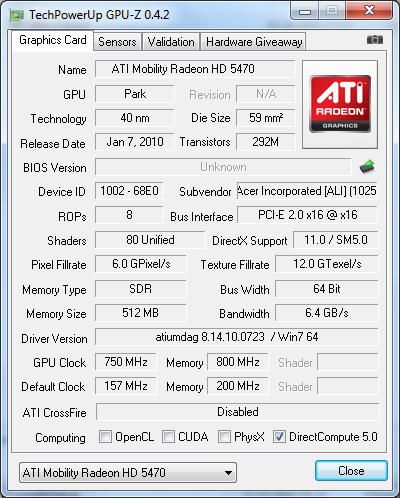 Although not explicitly indicated in Cyberlink's compatibility list, hardware acceleration can be enabled with ATI's HD 5470 GPU for video converting. We've downconverted a H.264 Full HD trailer (1920x800) to an iPhone compatible format in order to get a rough impression of the potential. Aside from a velocity advantage of about 25%, especially the processor load turns out a lot lower, in comparison to converting with the not exactly slow Core i3-330M CPU. Our prototype's gaming performance is merely enough for games with scaled down quality settings. If definitely sufficient for occasional gamers; more demanding users should look around for a more powerful model instead. Sims 3 is hardly playable in maximum quality settings with 13 fps and stutters enormously. We even only reach 28 fps in medium settings and XGA resolution. First omitting further details allows higher resolutions and makes the TimelineX's native display resolution available. Despite a similar frame rate of 11 fps in maximum settings, Anno 1404 seems to be more playable than Sims 3. Nevertheless, first a waiver of details and quality setting lead to a playable rate, which also has a bit of performance reserve even with cards working to capacity. 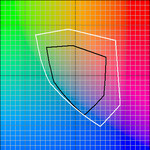 In return, Racedriver: Grid appears astonishingly smooth even with 19.4 fps. 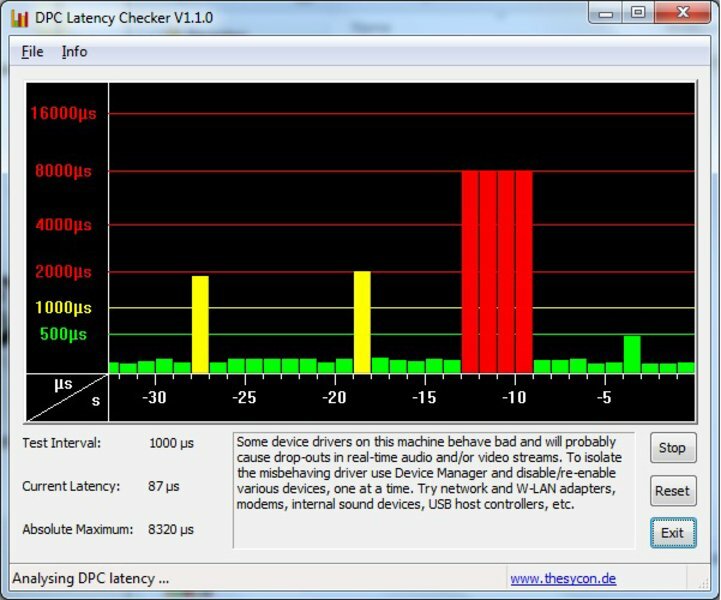 There is hardly any stuttering and even the backgrounds are set up at an acceptable rate. However, it's first real fun in reduced quality and resolutions with 35 fps. 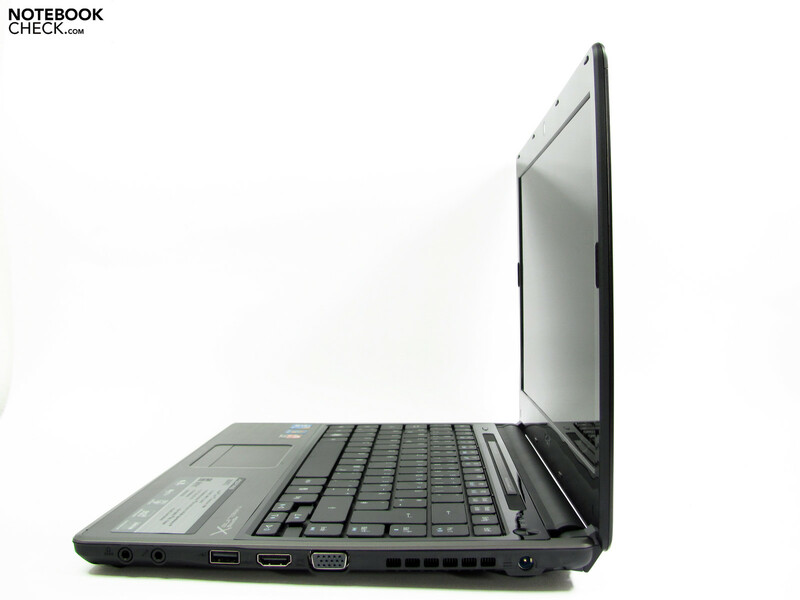 Due to the active, integrated Intel HD graphics, the Timeline 3820TG has the attribute of working very quietly under low load. We've determined a good 30.5 dB (A), which only increases to a moderate 32.6 dB (A) even in high performance profile. 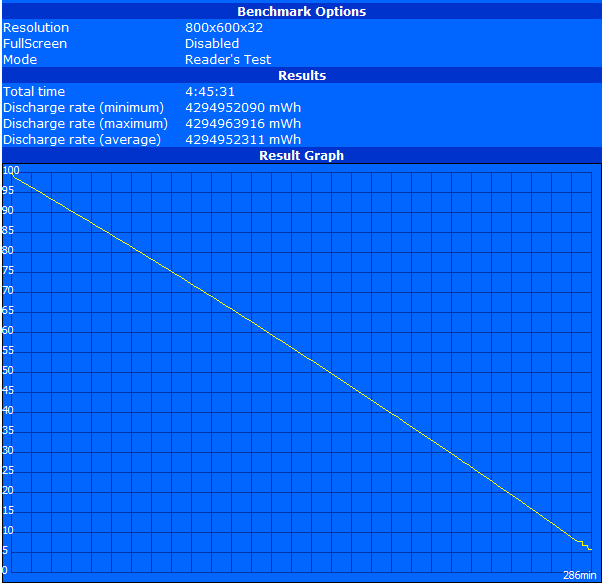 We measured a maximum of 33.6 dB (A) in the Intel graphics. 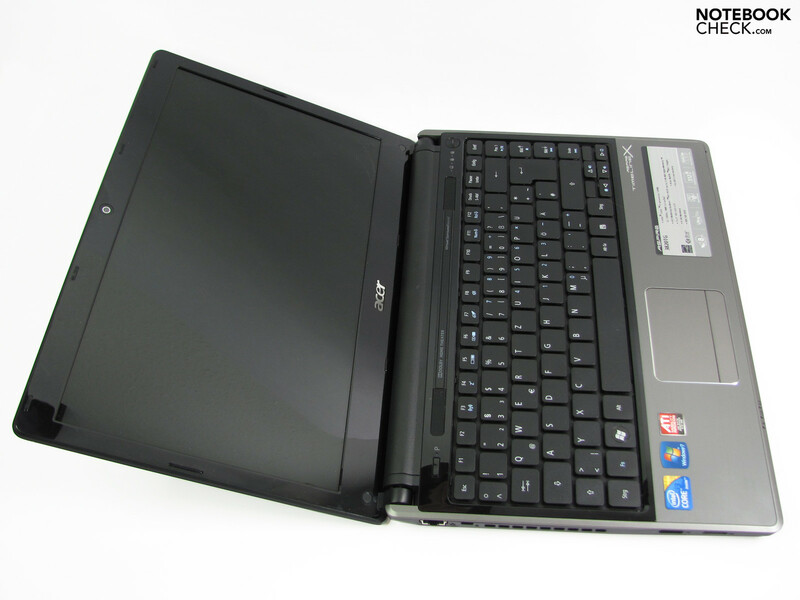 When the dedicated ATI HD 5470 is added, the Acer Timeline also has to take a higher power consumption in account though and lies between 36.9 dB (A) to a maximum of 40.8 dB (A) under load. It's striking that the fan is obviously paced down after a short time of load and bids an overall pleasant noise behavior. The surfaces stay overall pleasant at "normal" use and don't show any irregularities. We measured temperatures from 25.8°C to a maximum of 33.1°C on the upper and bottom sides. We first reached a critical rate of almost 50°C in one spot on the bottom after an hour of continuous load, which excludes a use on the lap. In return, all other measuring points remained less than 40°C and don't give reason for complaint. (±) The average temperature of the palmrest area of similar devices was 28.6 °C / 83.5 F (-0.5 °C / -0.9 F). 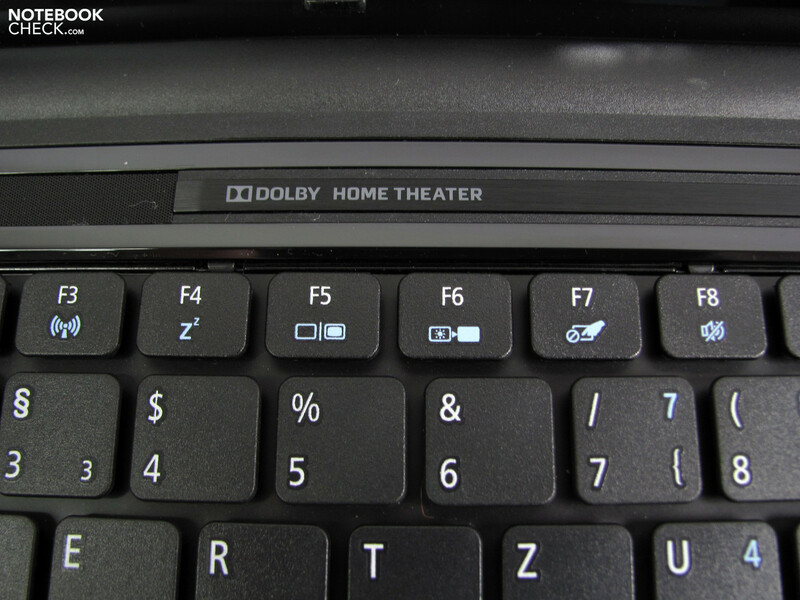 The logo, "Dolby Home Theater", above the keyboard jumps at the user and fuels expectations. In any case, this label doesn't contain a quality statement, as the sounds are too treble-prone and exempt of bass. 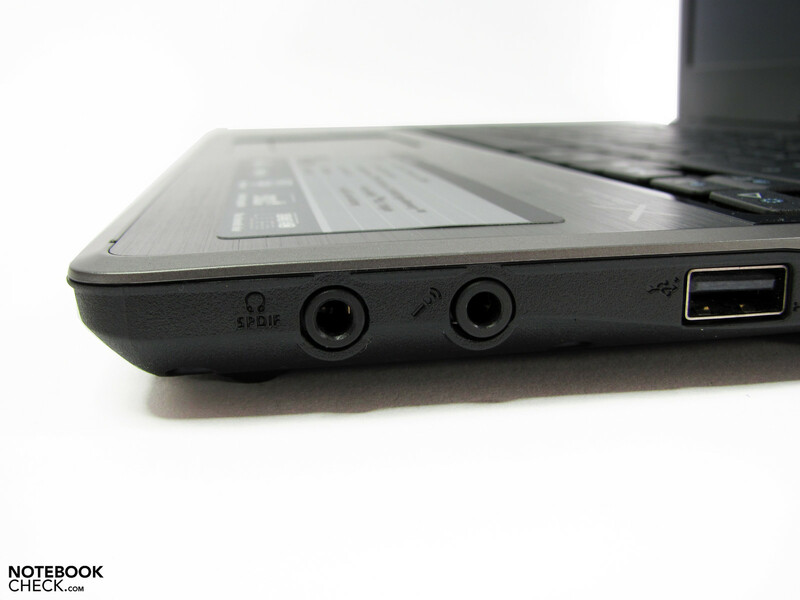 The narrow loudspeaker strips have been placed in the same bar as the Dolby logo. A digital audio signal can be lead out over the audio output via S/PDIF. The volume covers quite a large range, but distorts in higher volume settings a bit. Headphones or separate loudspeakers thus belong to the mandatory peripherals if more than system sounds and basic tasks are to be covered. Acer promises, as in the predecessor, runtimes of up to 8 hours with the 67 Wh 6 cell battery. This may first be hard to believe in view of the configuration. 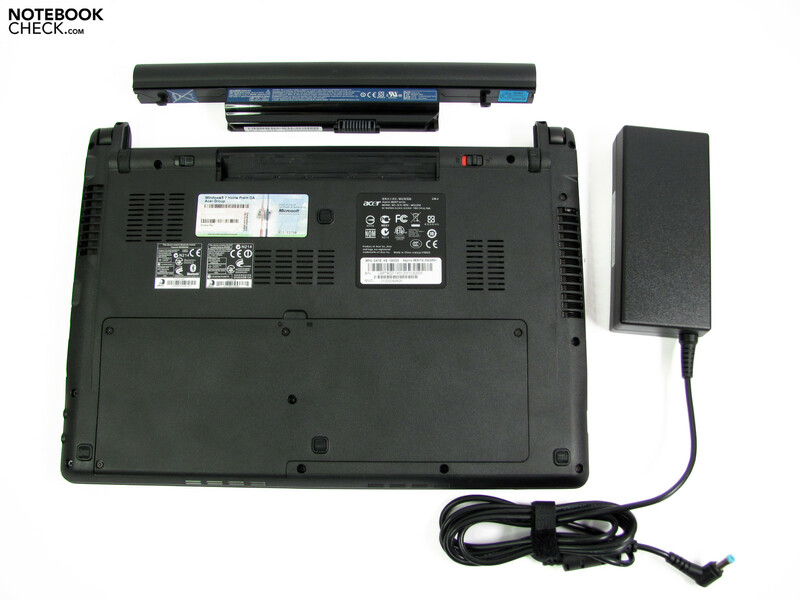 Acer optionally offers a 90 Wh 9 cell battery that allegedly is even good for up to 12 hours. We established a power consumption of 8.2 watts in idle with all energy savings options on minimum in our consumption measurements. Naturally, Intel's HD graphics was part of it. This rate increases to 17.9 watts with the dedicated ATI chip. Depending on the setting and activity, it increases up to 47.7 (Intel) and 67 watts (ATI) under full load. 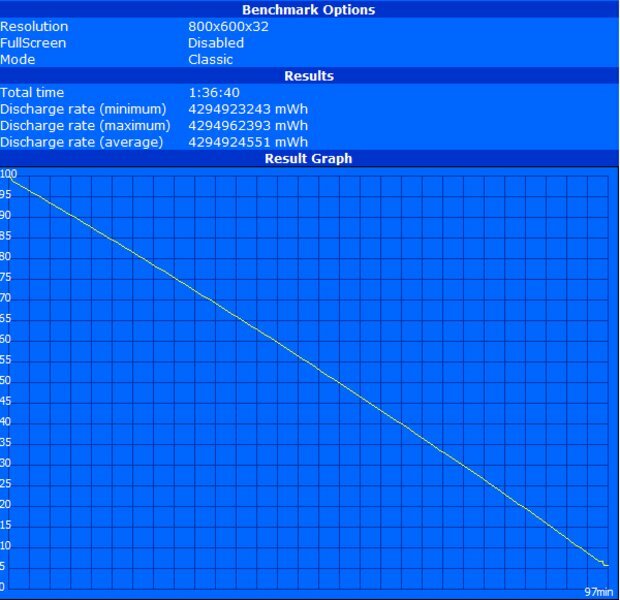 The savings potential behind "switchable graphics" is ultimately shown in our runtime measurements. 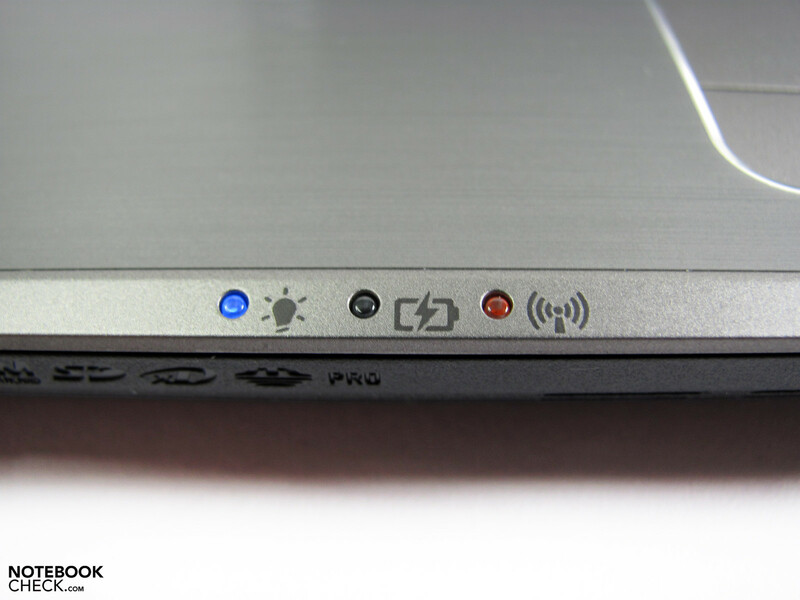 Acer seems to have hidden a few additional energy savings settings, which only have an impact in battery mode. We've checked both the maximum possible battery life with Intel's HD as well as with ATI's HD 5470 in BatteryEater's Reader's test. Whilst the ATI solution already bids a tasty appetizer with a good 286 minutes, the alternative Intel solution piles up in the runtime measurement and reaches 390 minutes of endurance. This is by far not the 669 minutes which the predecessor 3810 reached in our test, but yet very impressive in view of the considerably higher computing effort. The operating time is reduced to 97 minutes in the BatteryEater's Classic test (minimum possible runtime with all consumers and maximum brightness) with ATI's HD 5470. 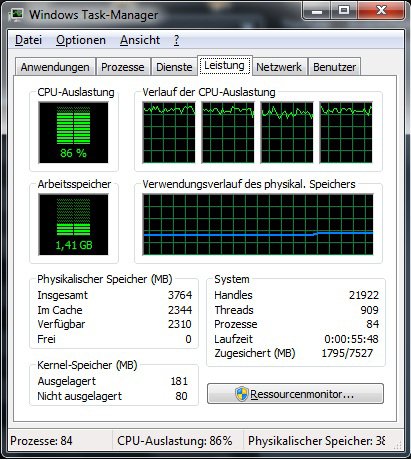 WLAN surfing, with a good 5 hours, and rendering movie files from the hard disk, with a good 4 hours, is somewhere in between. 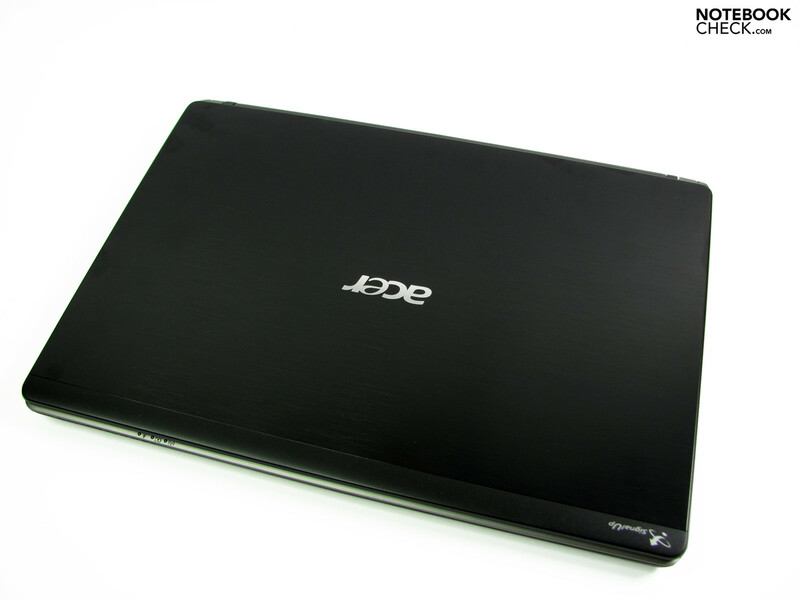 The Acer Aspire Timeline X 3820TG has gained a lot of performance in comparison to its predecessor. 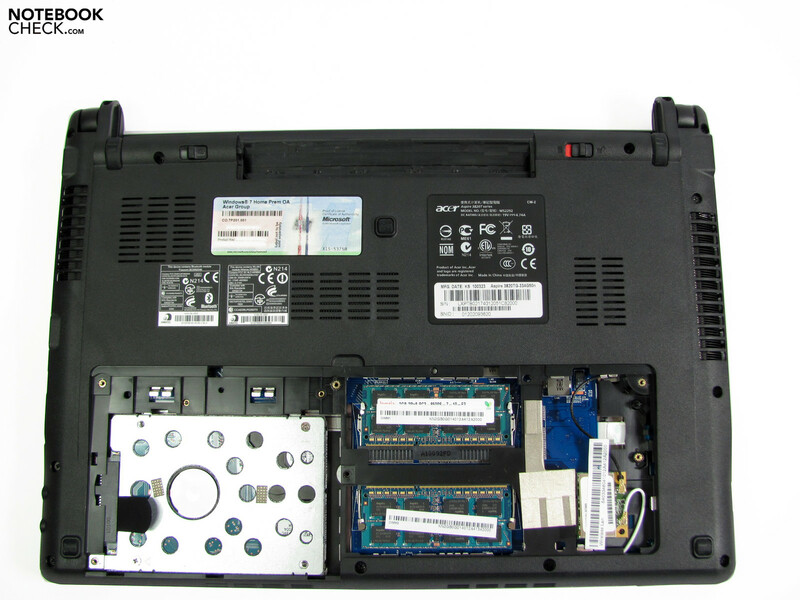 The combination of a Core i3-330M, Intel HD and ATI HD 5470 (switchable graphics) unites a high computing performance with a moderate power consumption. Noise and heat emissions also benefit from this, as they are very restrained under low demand. 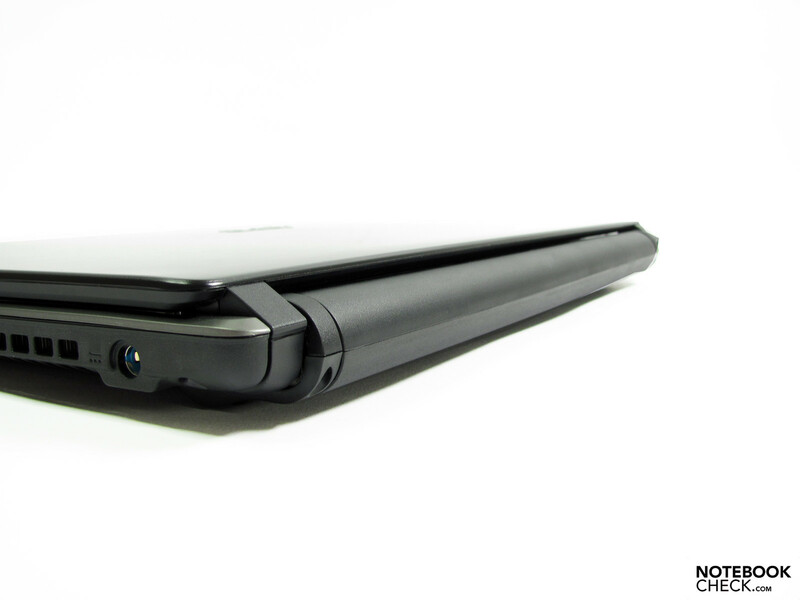 The low weight and good battery life is pleasing for daily mobile business. It wasn't possible to keep the Timeline 3810's record-breaking endurance qualities, but it's still within a good field. The only thing in the way of an unlimited mobile use is the contrast poor, too dark and reflective display. Thus, outdoor use shouldn't be considered. 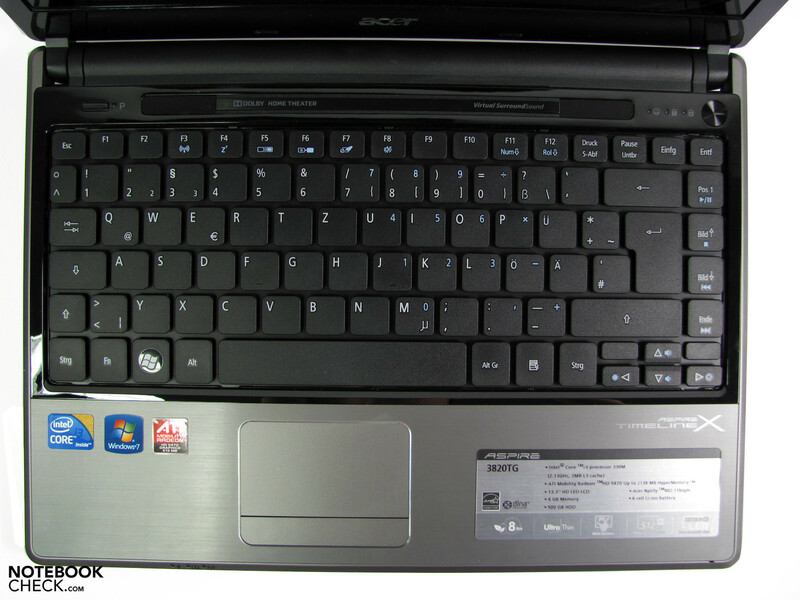 The workmanship and material quality have a high quality, but then again, it's dimmed by the yielding and coiling keyboard. Nothing for frequent typists. The connectivity has barely been modified and is still measured tight. 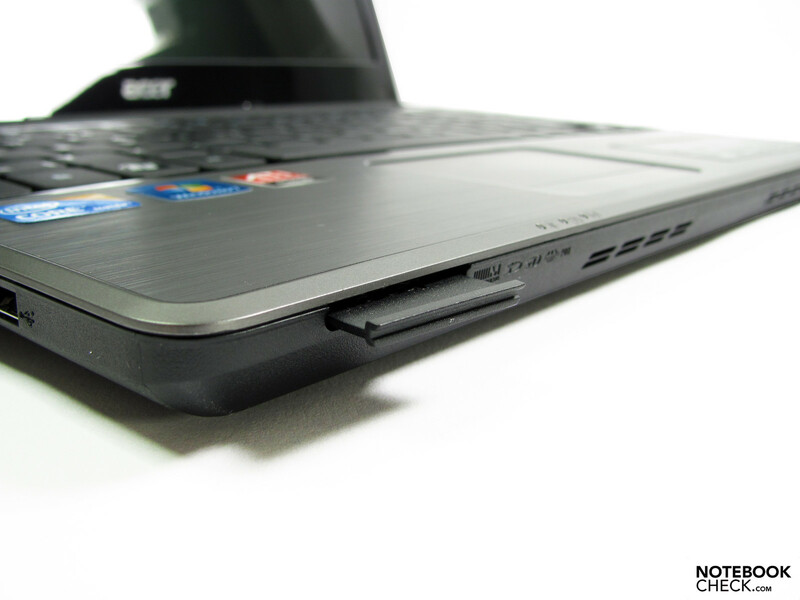 Especially the omitted ExpressCard slot is painful because even a possible self-remedy is prevented. 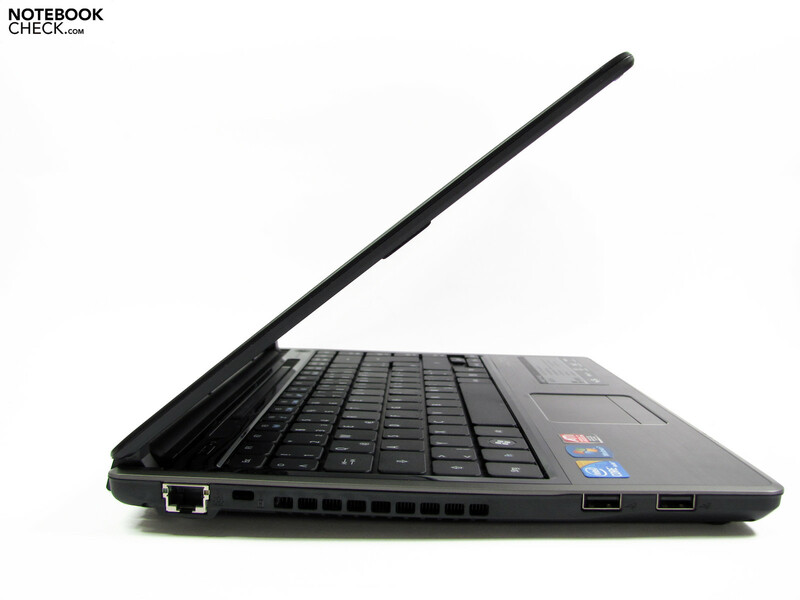 Generally, Acer has been successful in balancing performance and mobility with the Timeline X 3820TG. It advances in the range of established, powerful and, in particular, expensive subnotebooks. 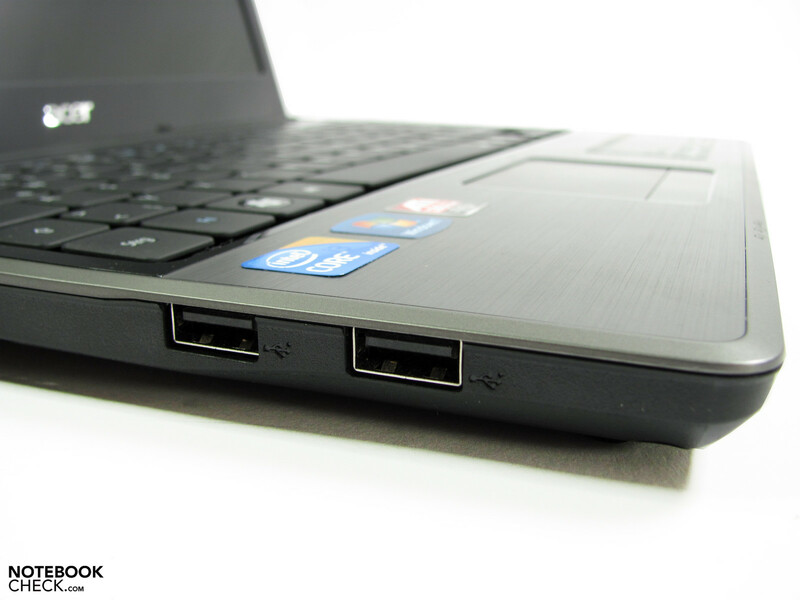 You'll have to make the one or other compromise, but the 13 incher is an alternative worth considering in any case. 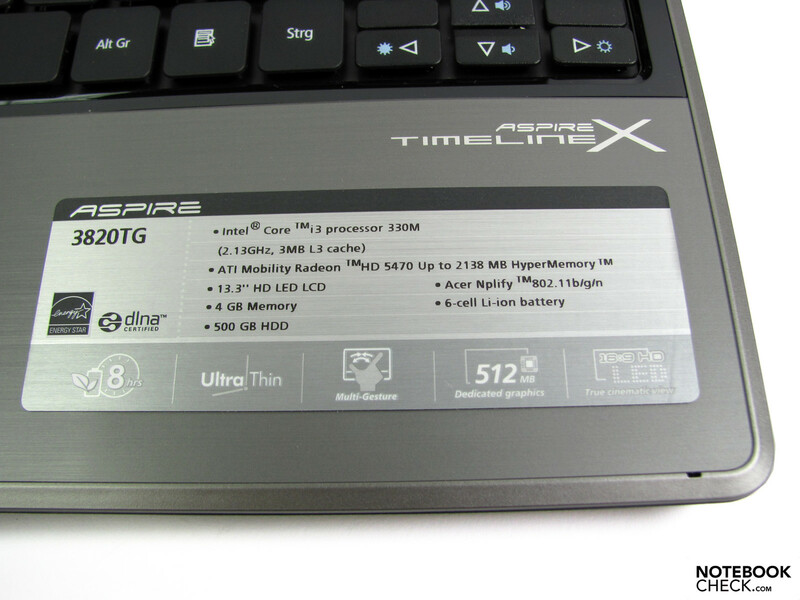 The Timeline X is the heir to the successful Aspire 3810T. ...that additionally provides for reflective distractions. The hinges keep the screen sufficiently in place. which can't quite reach the promised runtime. But it's good anyway in relation to performance. Single keys with gaps for foreign objects. Strong battery with a 67 Wh capacity. 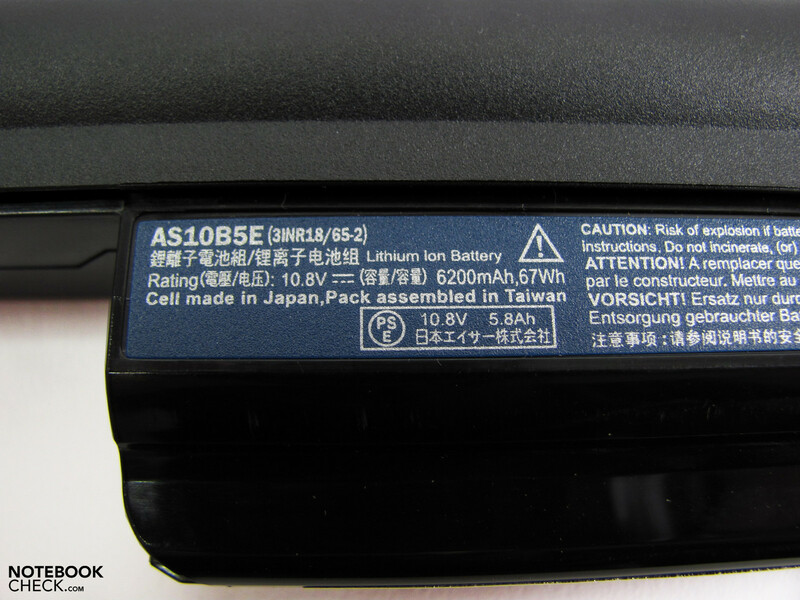 A 90 Wh battery is optionally available. The display can be tilted sufficiently. 2 laterally placed fans take care of cooling. The DC-in is pleasantly far back. Performance was at the top of the "to do list". and the almost identical keyboard. The connectivity is on par with netbooks. 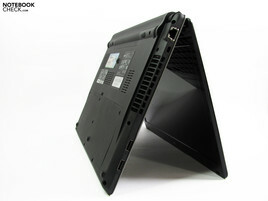 The profile is very slim. The adapter doesn't only serve a higher power consumption. HDMI makes a digital monitor connection possible. You get digital sound via S/PDIF over the audio-out. The cardreader is easy to access on the front. ..but have been placed exemplary far enough apart for broad USB sticks. 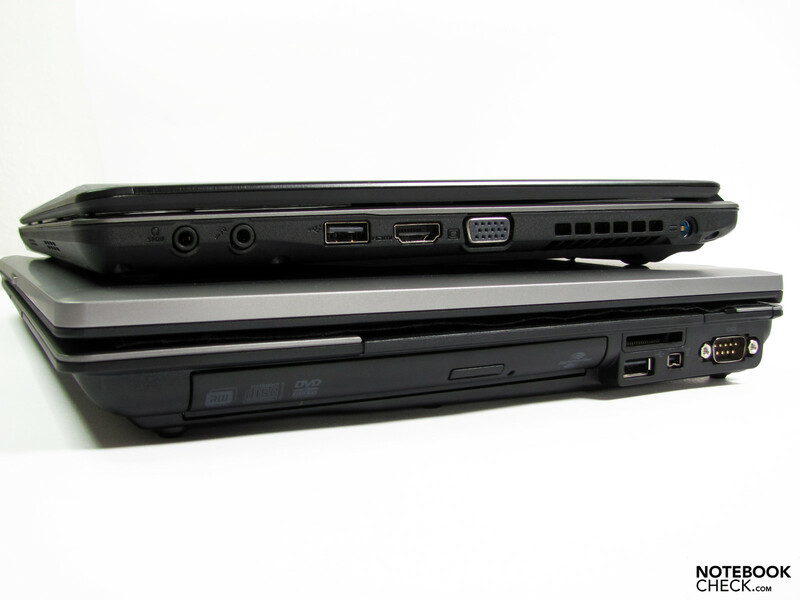 A lot simmer in comparison to HP's Probook. The overall concept with "switchable graphics", which covers a wide range of applications. A reasonable display and at least one fast interface. 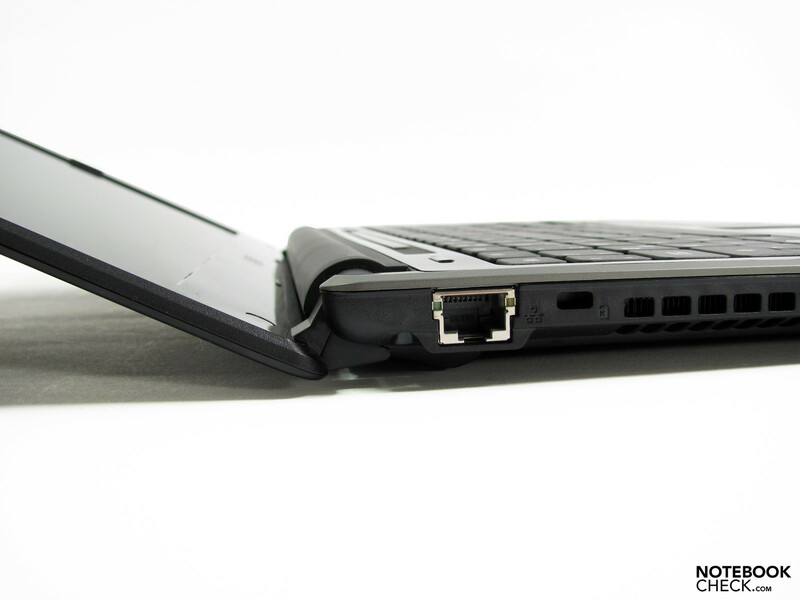 Currently, Sony's Vaio VPC-S11 is the only 13" competitor with a Core i3.